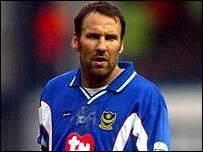 Walsall have emerged as the favourites to sign Paul Merson after West Brom turned down the chance to sign him. Portsmouth manager Harry Redknapp said on Monday that he had given the former England international permission to speak to two Midlands clubs about a move away from Fratton Park. Merson is understood to have opened negotiations with Colin Lee's First Division side about a move to the Bescot Stadium. The 35-year-old, whose young family still live in the Midlands, is thought to be unsettled and has also had discussions with West Brom. But Baggies boss Gary Megson vetoed the idea of signing Merson, who played a major role in getting Portsmouth promoted to the Premiership last season. "I discussed the idea [of signing Merson] with the manager but Gary doesn't believe Merson fits in with our current plans," said West Brom chairman Jeremy Peace. Walsall would be keen to land a player of Merson's quality and experience, but any possible deal would have to be at the right price. The Saddlers have made a profit in each of the past 11 seasons and are unlikely to abandon their prudent financial policy given that Lee has been ordered to trim the wage bill by £1m. If Portsmouth are willing to settle Merson's contract, which still has a year to run, the pay-out may allow him to fall in line with Walsall's wage structure. Meanwhile, Redknapp is still hoping he can persuade Spurs veteran Darren Anderton to return to his former club. He said: "I've spoken to Spurs but it's not gone very far at the moment. If we can put a deal together I think we can get him here. "He is still a quality player. I know he's had his injury problems but I think he could do a very good job for us." Redknapp has continued his reshaping of Portsmouth's squad for life in the Premiership by signing goalkeeper Harald Wapenaar on a three-year deal.